Most of the following Kwaidan, or Weird Tales, have been taken from old Japanese books,—such as the Yaso-Kidan, Bukkyo-Hyakkwa-Zensho, Kokon-Chomonshu, Tama-Sudare, and Hyaku-Monogatari. Some of the stories may have had a Chinese origin: the very remarkable "Dream of Akinosuke," for example, is certainly from a Chinese source. But the story-teller, in every case, has so recolored and reshaped his borrowing as to naturalize it... One queer tale, "Yuki-Onna," was told me by a farmer of Chofu, Nishitama-gori, in Musashi province, as a legend of his native village. Whether it has ever been written in Japanese I do not know; but the extraordinary belief which it records used certainly to exist in most parts of Japan, and in many curious forms... The incident of "Riki-Baka" was a personal experience; and I wrote it down almost exactly as it happened, changing only a family-name mentioned by the Japanese narrator. 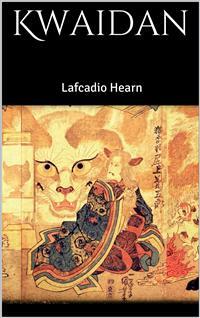 The publication of a new volume of Lafcadio Hearn's exquisite studies of Japan happens, by a delicate irony, to fall in the very month when the world is waiting with tense expectation for news of the latest exploits of Japanese battleships. Whatever the outcome of the present struggle between Russia and Japan, its significance lies in the fact that a nation of the East, equipped with Western weapons and girding itself with Western energy of will, is deliberately measuring strength against one of the great powers of the Occident. No one is wise enough to forecast the results of such a conflict upon the civilization of the world. The best one can do is to estimate, as intelligently as possible, the national characteristics of the peoples engaged, basing one's hopes and fears upon the psychology of the two races rather than upon purely political and statistical studies of the complicated questions involved in the present war. The Russian people have had literary spokesmen who for more than a generation have fascinated the European audience. The Japanese, on the other hand, have possessed no such national and universally recognized figures as Turgenieff or Tolstoy. They need an interpreter.It may be doubted whether any oriental race has ever had an interpreter gifted with more perfect insight and sympathy than Lafcadio Hearn has brought to the translation of Japan into our occidental speech. His long residence in that country, his flexibility of mind, poetic imagination, and wonderfully pellucid style have fitted him for the most delicate of literary tasks. He has seen marvels, and he has told of them in a marvelous way. There is scarcely an aspect of contemporary Japanese life, scarcely an element in the social, political, and military questions involved in the present conflict with Russia which is not made clear in one or another of the books with which he has charmed American readers.He characterizes Kwaidan as "stories and studies of strange things." A hundred thoughts suggested by the book might be written down, but most of them would begin and end with this fact of strangeness. To read the very names in the table of contents is like listening to a Buddhist bell, struck somewhere far away. Some of his tales are of the long ago, and yet they seem to illumine the very souls and minds of the little men who are at this hour crowding the decks of Japan's armored cruisers. But many of the stories are about women and children,—the lovely materials from which the best fairy tales of the world have been woven. They too are strange, these Japanese maidens and wives and keen-eyed, dark-haired girls and boys; they are like us and yet not like us; and the sky and the hills and the flowers are all different from ours. Yet by a magic of which Mr. Hearn, almost alone among contemporary writers, is the master, in these delicate, transparent, ghostly sketches of a world unreal to us, there is a haunting sense of spiritual reality.In a penetrating and beautiful essay contributed to the "Atlantic Monthly" in February, 1903, by Paul Elmer More, the secret of Mr. Hearn's magic is said to lie in the fact that in his art is found "the meeting of three ways." "To the religious instinct of India—Buddhism in particular,—which history has engrafted on the aesthetic sense of Japan, Mr. Hearn brings the interpreting spirit of occidental science; and these three traditions are fused by the peculiar sympathies of his mind into one rich and novel compound,—a compound so rare as to have introduced into literature a psychological sensation unknown before." Mr. More's essay received the high praise of Mr. Hearn's recognition and gratitude, and if it were possible to reprint it here, it would provide a most suggestive introduction to these new stories of old Japan, whose substance is, as Mr. More has said, "so strangely mingled together out of the austere dreams of India and the subtle beauty of Japan and the relentless science of Europe. "Most of the following Kwaidan, or Weird Tales, have been taken from old Japanese books,—such as the Yaso-Kidan, Bukkyo-Hyakkwa-Zensho, Kokon-Chomonshu, Tama-Sudare, and Hyaku-Monogatari. Some of the stories may have had a Chinese origin: the very remarkable "Dream of Akinosuke," for example, is certainly from a Chinese source. But the story-teller, in every case, has so recolored and reshaped his borrowing as to naturalize it... One queer tale, "Yuki-Onna," was told me by a farmer of Chofu, Nishitama-gori, in Musashi province, as a legend of his native village. Whether it has ever been written in Japanese I do not know; but the extraordinary belief which it records used certainly to exist in most parts of Japan, and in many curious forms... The incident of "Riki-Baka" was a personal experience; and I wrote it down almost exactly as it happened, changing only a family-name mentioned by the Japanese narrator. L.H. More than seven hundred years ago, at Dan-no-ura, in the Straits of Shimonoseki, was fought the last battle of the long contest between the Heike, or Taira clan, and the Genji, or Minamoto clan. There the Heike perished utterly, with their women and children, and their infant emperor likewise—now remembered as Antoku Tenno. And that sea and shore have been haunted for seven hundred years... Elsewhere I told you about the strange crabs found there, called Heike crabs, which have human faces on their backs, and are said to be the spirits of the Heike warriors . But there are many strange things to be seen and heard along that coast. On dark nights thousands of ghostly fires hover about the beach, or flit above the waves,—pale lights which the fishermen call Oni-bi, or demon-fires; and, whenever the winds are up, a sound of great shouting comes from that sea, like a clamor of battle.In former years the Heike were much more restless than they now are. They would rise about ships passing in the night, and try to sink them; and at all times they would watch for swimmers, to pull them down. It was in order to appease those dead that the Buddhist temple, Amidaji, was built at Akamagaseki . A cemetery also was made close by, near the beach; and within it were set up monuments inscribed with the names of the drowned emperor and of his great vassals; and Buddhist services were regularly performed there, on behalf of the spirits of them. After the temple had been built, and the tombs erected, the Heike gave less trouble than before; but they continued to do queer things at intervals,—proving that they had not found the perfect peace.Some centuries ago there lived at Akamagaseki a blind man named Hoichi, who was famed for his skill in recitation and in playing upon the biwa . From childhood he had been trained to recite and to play; and while yet a lad he had surpassed his teachers. As a professional biwa-hoshi he became famous chiefly by his recitations of the history of the Heike and the Genji; and it is said that when he sang the song of the battle of Dan-no-ura "even the goblins [kijin] could not refrain from tears. "At the outset of his career, Hoichi was very poor; but he found a good friend to help him. The priest of the Amidaji was fond of poetry and music; and he often invited Hoichi to the temple, to play and recite. Afterwards, being much impressed by the wonderful skill of the lad, the priest proposed that Hoichi should make the temple his home; and this offer was gratefully accepted. Hoichi was given a room in the temple-building; and, in return for food and lodging, he was required only to gratify the priest with a musical performance on certain evenings, when otherwise disengaged.One summer night the priest was called away, to perform a Buddhist service at the house of a dead parishioner; and he went there with his acolyte, leaving Hoichi alone in the temple. It was a hot night; and the blind man sought to cool himself on the verandah before his sleeping-room. The verandah overlooked a small garden in the rear of the Amidaji. There Hoichi waited for the priest's return, and tried to relieve his solitude by practicing upon his biwa. Midnight passed; and the priest did not appear. But the atmosphere was still too warm for comfort within doors; and Hoichi remained outside. At last he heard steps approaching from the back gate. Somebody crossed the garden, advanced to the verandah, and halted directly in front of him—but it was not the priest. A deep voice called the blind man's name—abruptly and unceremoniously, in the manner of a samurai summoning an inferior:—"Hoichi!""Hai!" (1) answered the blind man, frightened by the menace in the voice,—"I am blind!—I cannot know who calls! ""There is nothing to fear," the stranger exclaimed, speaking more gently. "I am stopping near this temple, and have been sent to you with a message. My present lord, a person of exceedingly high rank, is now staying in Akamagaseki, with many noble attendants. He wished to view the scene of the battle of Dan-no-ura; and to-day he visited that place. Having heard of your skill in reciting the story of the battle, he now desires to hear your performance: so you will take your biwa and come with me at once to the house where the august assembly is waiting. "In those times, the order of a samurai was not to be lightly disobeyed. Hoichi donned his sandals, took his biwa, and went away with the stranger, who guided him deftly, but obliged him to walk very fast. The hand that guided was iron; and the clank of the warrior's stride proved him fully armed,—probably some palace-guard on duty. Hoichi's first alarm was over: he began to imagine himself in good luck;—for, remembering the retainer's assurance about a "person of exceedingly high rank," he thought that the lord who wished to hear the recitation could not be less than a daimyo of the first class. Presently the samurai halted; and Hoichi became aware that they had arrived at a large gateway;—and he wondered, for he could not remember any large gate in that part of the town, except the main gate of the Amidaji. "Kaimon!" the samurai called,—and there was a sound of unbarring; and the twain passed on. They traversed a space of garden, and halted again before some entrance; and the retainer cried in a loud voice, "Within there! I have brought Hoichi." Then came sounds of feet hurrying, and screens sliding, and rain-doors opening, and voices of women in converse. By the language of the women Hoichi knew them to be domestics in some noble household; but he could not imagine to what place he had been conducted. Little time was allowed him for conjecture. After he had been helped to mount several stone steps, upon the last of which he was told to leave his sandals, a woman's hand guided him along interminable reaches of polished planking, and round pillared angles too many to remember, and over widths amazing of matted floor,—into the middle of some vast apartment. There he thought that many great people were assembled: the sound of the rustling of silk was like the sound of leaves in a forest. He heard also a great humming of voices,—talking in undertones; and the speech was the speech of courts.Hoichi was told to put himself at ease, and he found a kneeling-cushion ready for him. After having taken his place upon it, and tuned his instrument, the voice of a woman—whom he divined to be the Rojo, or matron in charge of the female service—addressed him, saying,—"It is now required that the history of the Heike be recited, to the accompaniment of the biwa. "Now the entire recital would have required a time of many nights: therefore Hoichi ventured a question:—"As the whole of the story is not soon told, what portion is it augustly desired that I now recite? "The woman's voice made answer:—"Recite the story of the battle at Dan-no-ura,—for the pity of it is the most deep." Then Hoichi lifted up his voice, and chanted the chant of the fight on the bitter sea,—wonderfully making his biwa to sound like the straining of oars and the rushing of ships, the whirr and the hissing of arrows, the shouting and trampling of men, the crashing of steel upon helmets, the plunging of slain in the flood. And to left and right of him, in the pauses of his playing, he could hear voices murmuring praise: "How marvelous an artist! "—"Never in our own province was playing heard like this! "—"Not in all the empire is there another singer like Hoichi!" Then fresh courage came to him, and he played and sang yet better than before; and a hush of wonder deepened about him. But when at last he came to tell the fate of the fair and helpless,—the piteous perishing of the women and children,—and the death-leap of Nii-no-Ama, with the imperial infant in her arms,—then all the listeners uttered together one long, long shuddering cry of anguish; and thereafter they wept and wailed so loudly and so wildly that the blind man was frightened by the violence and grief that he had made. For much time the sobbing and the wailing continued. But gradually the sounds of lamentation died away; and again, in the great stillness that followed, Hoichi heard the voice of the woman whom he supposed to be the Rojo.She said:—"Although we had been assured that you were a very skillful player upon the biwa, and without an equal in recitative, we did not know that any one could be so skillful as you have proved yourself to-night. Our lord has been pleased to say that he intends to bestow upon you a fitting reward. But he desires that you shall perform before him once every night for the next six nights—after which time he will probably make his august return-journey. To-morrow night, therefore, you are to come here at the same hour. The retainer who to-night conducted you will be sent for you... There is another matter about which I have been ordered to inform you. It is required that you shall speak to no one of your visits here, during the time of our lord's august sojourn at Akamagaseki. As he is traveling incognito,  he commands that no mention of these things be made... You are now free to go back to your temple. "After Hoichi had duly expressed his thanks, a woman's hand conducted him to the entrance of the house, where the same retainer, who had before guided him, was waiting to take him home. The retainer led him to the verandah at the rear of the temple, and there bade him farewell.It was almost dawn when Hoichi returned; but his absence from the temple had not been observed,—as the priest, coming back at a very late hour, had supposed him asleep. During the day Hoichi was able to take some rest; and he said nothing about his strange adventure. In the middle of the following night the samurai again came for him, and led him to the august assembly, where he gave another recitation with the same success that had attended his previous performance. But during this second visit his absence from the temple was accidentally discovered; and after his return in the morning he was summoned to the presence of the priest, who said to him, in a tone of kindly reproach:—"We have been very anxious about you, friend Hoichi. To go out, blind and alone, at so late an hour, is dangerous. Why did you go without telling us? I could have ordered a servant to accompany you. And where have you been? "Hoichi answered, evasively,—"Pardon me kind friend! I had to attend to some private business; and I could not arrange the matter at any other hour. "The priest was surprised, rather than pained, by Hoichi's reticence: he felt it to be unnatural, and suspected something wrong. He feared that the blind lad had been bewitched or deluded by some evil spirits. He did not ask any more questions; but he privately instructed the men-servants of the temple to keep watch upon Hoichi's movements, and to follow him in case that he should again leave the temple after dark.On the very next night, Hoichi was seen to leave the temple; and the servants immediately lighted their lanterns, and followed after him. But it was a rainy night, and very dark; and before the temple-folks could get to the roadway, Hoichi had disappeared. Evidently he had walked very fast,—a strange thing, considering his blindness; for the road was in a bad condition. The men hurried through the streets, making inquiries at every house which Hoichi was accustomed to visit; but nobody could give them any news of him. At last, as they were returning to the temple by way of the shore, they were startled by the sound of a biwa, furiously played, in the cemetery of the Amidaji. Except for some ghostly fires—such as usually flitted there on dark nights—all was blackness in that direction. But the men at once hastened to the cemetery; and there, by the help of their lanterns, they discovered Hoichi,—sitting alone in the rain before the memorial tomb of Antoku Tenno, making his biwa resound, and loudly chanting the chant of the battle of Dan-no-ura. And behind him, and about him, and everywhere above the tombs, the fires of the dead were burning, like candles. Never before had so great a host of Oni-bi appeared in the sight of mortal man..."Hoichi San!—Hoichi San!" the servants cried,—"you are bewitched!... Hoichi San! "But the blind man did not seem to hear. Strenuously he made his biwa to rattle and ring and clang;—more and more wildly he chanted the chant of the battle of Dan-no-ura. They caught hold of him;—they shouted into his ear,—"Hoichi San!—Hoichi San!—come home with us at once! "Reprovingly he spoke to them:—"To interrupt me in such a manner, before this august assembly, will not be tolerated. "Whereat, in spite of the weirdness of the thing, the servants could not help laughing. Sure that he had been bewitched, they now seized him, and pulled him up on his feet, and by main force hurried him back to the temple,—where he was immediately relieved of his wet clothes, by order of the priest. Then the priest insisted upon a full explanation of his friend's astonishing behavior.Hoichi long hesitated to speak. But at last, finding that his conduct had really alarmed and angered the good priest, he decided to abandon his reserve; and he related everything that had happened from the time of first visit of the samurai.The priest said:—"Hoichi, my poor friend, you are now in great danger! How unfortunate that you did not tell me all this before! Your wonderful skill in music has indeed brought you into strange trouble. By this time you must be aware that you have not been visiting any house whatever, but have been passing your nights in the cemetery, among the tombs of the Heike;—and it was before the memorial-tomb of Antoku Tenno that our people to-night found you, sitting in the rain. All that you have been imagining was illusion—except the calling of the dead. By once obeying them, you have put yourself in their power. If you obey them again, after what has already occurred, they will tear you in pieces. But they would have destroyed you, sooner or later, in any event... Now I shall not be able to remain with you to-night: I am called away to perform another service. But, before I go, it will be necessary to protect your body by writing holy texts upon it. "Before sundown the priest and his acolyte stripped Hoichi: then, with their writing-brushes, they traced upon his breast and back, head and face and neck, limbs and hands and feet,—even upon the soles of his feet, and upon all parts of his body,—the text of the holy sutra called Hannya-Shin-Kyo. When this had been done, the priest instructed Hoichi, saying:—"To-night, as soon as I go away, you must seat yourself on the verandah, and wait. You will be called. But, whatever may happen, do not answer, and do not move. Say nothing and sit still—as if meditating. If you stir, or make any noise, you will be torn asunder. Do not get frightened; and do not think of calling for help—because no help could save you. If you do exactly as I tell you, the danger will pass, and you will have nothing more to fear. "After dark the priest and the acolyte went away; and Hoichi seated himself on the verandah, according to the instructions given him. He laid his biwa on the planking beside him, and, assuming the attitude of meditation, remained quite still,—taking care not to cough, or to breathe audibly. For hours he stayed thus.